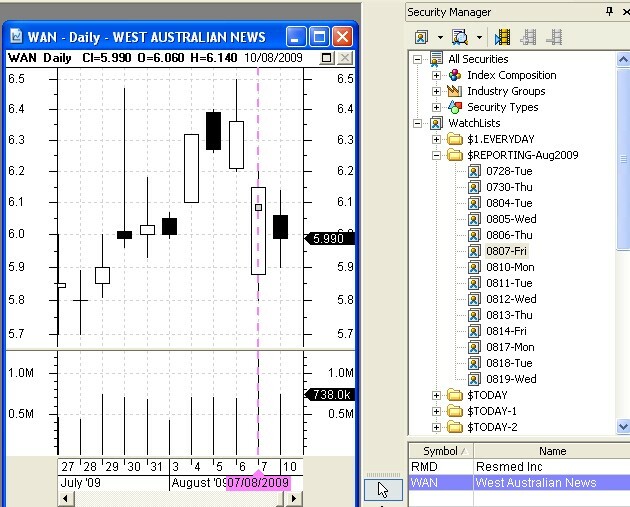 Welcome to the 16th edition of my (normally fortnightly) BullCharts software Tip Sheets, focussing on tips and hints for BullCharts (the Australian charting software package). I have to say that I can't believe how quickly the time flies in between writing these Tip Sheets. The big news this week that has kept me busy for a while is that I have managed to upload all of the BullCharts eNewsletter articles to my externally hosted and secure OnLine Shop. "What are these eNewsletter articles all about?" I can hear some people say. Well, they are in some ways similar to these free Tip Sheets, except they cover more detail, with better explanations and more screen shots and diagrams. And they have their own index numbering method so you can print them and file them away for easy reference, complete with their own frequently updated Table of Contents. Now that all the past BullCharts articles are online in the shop, you can browse the list of articles, and download the first page of any of them (or all of them) as the first page is available at no charge (ie. for free!). More details in the column at right. Now, being early August we are getting into the Australian company reporting season. Surely there is some way to leverage off the reporting season and the news that is announced! Some of this news will cause share prices to fall, whilst some news will cause prices to rise. If only we can be on top of this and take advantage of it. In this BullCharts Tip Sheet below I present some BullCharts tips describing how we really can take advantage of the reporting season using specific features in the BullCharts software. I also want to point out that I will be re-running my Hands-on Trading Workshop (CFDs, early evening, FTSE, strategy, one indicator, great experience) very soon - Friday evening 21 August at VSCH. The last couple of these workshops have been very well received. We are limited to only 8 people, and more details are on my web site: www.robertbrain.com. And one week after the Trading Workshop I will be running another of my Technical Analysis Intro seminars - Saturday afternoon 29 August at VSCH. The last couple of these seminars have been very well received. More details are on my web site: www.robertbrain.com. For both of these events, please contact the Vermont South Community House (VSCH) to make a booking. And, talking about my web site, you might have noticed that I recently did a radical make-over of the web site and the home page. I have renamed the whole site "Brainy's Share Market Toolbox" because it is building up to be a real toolbox full of useful tools to help you tackle the share market. Perhaps I should refer to the contents as an arsenal of weapons for tackling the market? Who reports on what dates? FACT - During our bi-annual company reporting season, some of our companies deliver a favourable financial report, resulting in a subsequent increase in share price. In some cases, the spur in share price can flow on for a few days, or perhaps weeks, or even longer. Mind you, if the company report is positive, but it is below the analysts' consensus expectations then the share price can actually fall. The converse also applies. Some reports can trigger a lasting fall in share price. Traders can take advantage of this by short selling the stock (or short selling a derivative of the stock like share CFDs). And, for many companies we know when each company intends to deliver their report. This information is readily available. So, armed with all this information, we can use BullCharts to set up one or more watchlists of the stocks to watch in certain weeks, or on certain days. It is then easy to visit our watchlist each evening, or each weekend, and quickly view the price charts of the companies that have just reported. It is also easy to peruse the results and relevant presentations, and we might then be able to make an investment decision based on our trading strategy. Use the BullCharts Quick News Search option to peruse a list of announcements, news and presentations. Okay, reporting season - what is it? Remember that in Australia we have two reporting seasons each year - one in February, and one in August. In these two months, most of our listed companies have to lodge their financial results for the previous 6 month period to the end of December and end of June respectively. This is a listing requirement according to the listing rules administered by the Australian Securities Exchange (ASX). If they do not lodge them by the end of the required month, then trading in their shares is suspended without question. The only companies to which this does not apply are those few that have a different period-end date (ie. not December/June). The listing rule still applies to these other companies, but they will report at different times with different deadline dates. When our companies lodge their financial results with the ASX, many of them make a big deal of it and have a formal briefing or news conference to also announce relevant information. This is often in the form of a PowerPoint-style of presentation, saved in PDF format. All of these materials are readily available from the ASX web site, and in many cases the larger companies will also make them available from the "Investor" section of their own web site. And in our BullCharts software, these same news releases and presentations are also readily available at the click of a button. To view the list of documents, simply view a price chart for a selected stock, then click on the "Quick News Search" button on the toolbar, or choose Actions - News - Quick News Search from the menu. A list of the companies that intend to report on certain dates is readily available from a number of sources (actually not very many - this is hard to find). Mind you, companies are not obliged to announce the date on which they will report, and they are entitled to announce a date and then change it. So any list of company reporting dates tends to be compiled by interested parties for the information of their own clients. One of these is the Board Room Radio web site - www.brr.com.au. Another at www.incomeinvestor.com.au. (You will need to enter any old email address to gain access - no problem). And another at www.egoli.com.au/researchtools.asp. Or you can check in the AFR newspaper each Monday for the week ahead (on page 3). Many brokers also provide this information for the use of their own clients. Your broker might publish a list. Try asking them for a copy. Now that you know when the companies are reporting, you can build a simple BullCharts watchlist. WAN price chart - The left-hand portion of the screen shot is a simple price chart of WAN, which was due to report results on Friday 7 August. On the price chart I had previously marked this date with a feint vertical dotted line so that the next time I viewed the price chart for WAN, this vertical line will indicate the intended reporting date. Note that I have IntelliCharts turned on so that BullCharts remembers these lines when I plonk them on the chart. Another TIP: I changed "My Defaults" for the Vertical Line tool in BullCharts, so that I could easily work down a list of stocks and plonk the line on the right date with the line parameters already set to: dashed line, feint colour. It is easy to change "My Defaults" for each of the tools. Then I won't get these vertical lines mixed up with any other vertical lines. Security Manager - The right hand half of the screen shot is my Security Manager. In the Security Manager, under the "Watchlists" heading, I have created a Watchlist Folder and called it "$REPORTING-Aug2009". The dollar sign forces the item towards the top of the list. If you don't have many watchlists then this is not an issue. But if you have many, then this TIP can be useful. And I included the reporting month in the name to keep it separate from the reporting last February, and for next February. It will also make it easier to delete the whole list of watchlists one day when I am done. Inside this Watchlist Folder I have created one Watchlist for each reporting date, and I have used the following format to force them to appear in chronological order:- MMDD (for month and date), then a hyphen for readability, and the day of the week (because it is useful). The watchlist that is "selected" in the screen shot is "0807-Fri". That is, August 7th. And the list of stocks in this watchlist are shown towards the bottom - just two: RMD and WAN. Now look at the price chart, and notice the big white candle on the reporting day, even though the Open price on the candle was about 50c below the previous day's Close. Now we can watch this stock for the next few days, and use our favourite indicators to determine if it is a buy or not. The new Chart Memo feature is included in BullCharts from version 3.8 onwards. To display the Memo panel, use the menu option: View - Show Chart Memo, or just hit Ctrl+W. Within the Memo, you could make your own notes about the reporting date, and any observations or intentions that you might have about the stock. This might include any broker or analyst comments about expectations from the newspaper or from your broker or subscribed news feeds or email newsletters. Of course, you can also drop Text boxes onto the chart (and either "Anchor to date" or not, as required). As you might know, I have been writing a series of BullCharts articles of about 4-pages each since last October. So I now have quite a collection of them (16 articles covering 63 printed pages). As of last week I now have all these BullCharts eNewsletter articles available individually on my secure online shop. They include some serious BullCharts tips, and "how-to" descriptions of many of the key features in BullCharts. The list of topics is too long to include here, and it is growing each month as I write another couple of articles. Feel free to browse the list of articles here. The first page of each article is available to download for free, to give you an overview of the content in the article. And some of the articles themselves are available for free (the single-page sheets, and the Contents and Overview sections - I have to give some things away for free). These BullCharts articles are the ones that I write each month for subscribers, along with articles on Share Trading and Technical Analysis. The back issues of the Share Trading and Technical Analysis articles are not yet up in the OnLine Shop, but they will be there very soon - I will let you know when it is done. If you have any questions about these, please feel free to email or phone me (or catchup at a BullCharts User Group meeting, or an ATAA meeting).